we expected to make arounk $2Kish... maybe a little more or a little less. BUT with all of your help -- and the INSANE amount of bids placed, we are literally right there almost at the $3K mark!!! YAAAAY!!! thank you thank you! friends! family! friends of friends! friends of family! and TOTAL STRANGERS! y'all are awesome! thank you to every person who shared our page, placed a bid, liked our page, and perused our auction items! and a very *SPECIAL* thank you to every single person who donated! we had an amazing 35 people donate a total of 84 items that went up for bid! ah! i cannot get over it! we are surrounded by so much talent and such an incredible amount of generosity! we love each and every one of you so dearly! you are helping bring our baby home! i can't say it enough... thank. you. and paying your initial agency fees... means we can officially be "matched" with a child! so OF COURSE we feel the urgency to get this portion paid just as quickly as possible!!!!! OH YES! 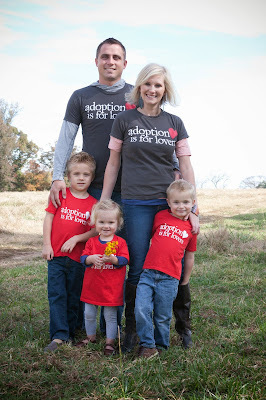 Adoption *IS* for lovers!!! Add a little 1 Corinthians 13:7 to the back, and you've got yourself a mighty fine shirt! Buy one for $20... or 3 or more for $15 each! **Add them to your auction winnings (before the end of the week) and they'll ship for FREE! !